Free admission to the farm. Tickets available for sale for children's activities. 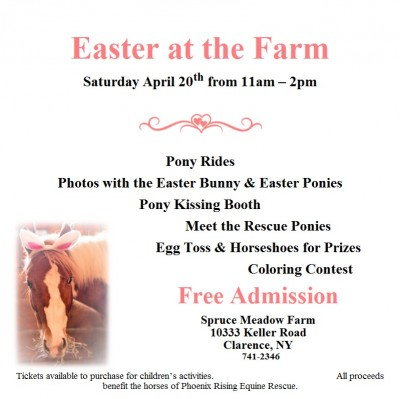 Pony rides, photo with the Easter Bunny, Pony kissing booth. Meet all the rescue horses. Egg toss and horseshoe toss for prizes and a coloring contest. All money raised goes toward the care of the Phoenix Rising rescue horses.